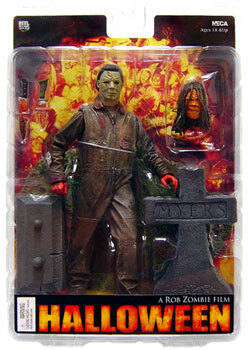 Description Of Item: Rob Zombie Film Halloween - Michael Myers. This version of Michael Myers is reminiscent of the original, although his grease-smeared mechanic?s jumpsuit is presented in a state of mild disrepair and his colorless corpselike Shatner-esque mask appears to be pretty filthy. The Michael Myers figure should presumably be equipped with his butcher knife.